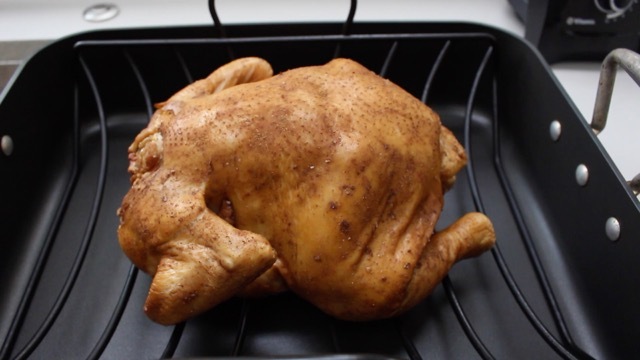 The Perfect Roasted Chicken. 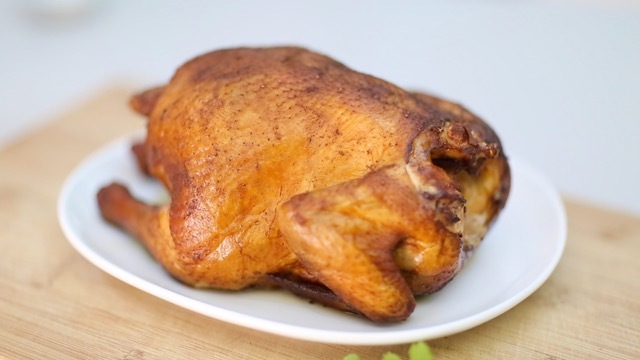 My 5-Spice Roasted Soy Chicken is amazingly moist and flavorful. Brined in a sweet soy sauce mixture, I'm taking a page from Thanksgiving and using this brine just as one would for a Turkey, ensuring tender and juicy meat. 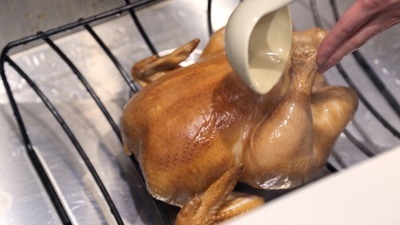 Brining only takes 3-4 hours, so you can do this earlier the same day, or prep the chicken the day before and let the skin crisp and air dry in your refrigerator overnight. 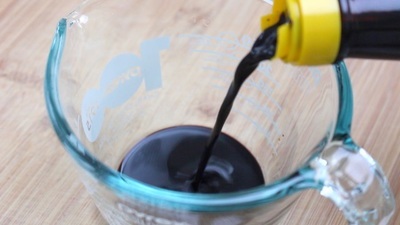 If you have the time and patience, this will make the skin crispy making for a nice presentation. 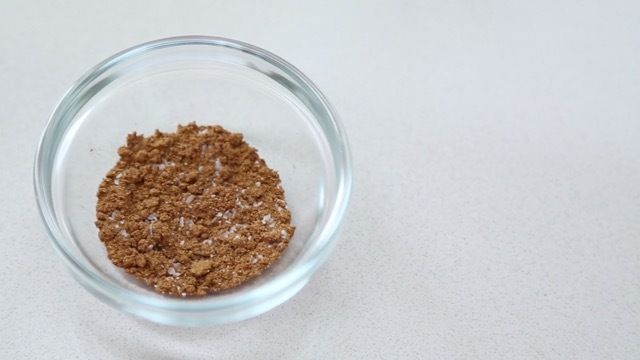 Once you try this recipe, you may not make roasted chicken any other way. ​This video recipe was sponsored by Pearl River Bridge. I really enjoyed using their line of Asian sauces to develop this amazing recipe. Do check them out at your local Asian Grocery store or online here. Ready in Total Time: 5 hr. Blanch the chicken with a pot of hot water to clean and tighten the skin. Pat dry with paper towels and place upright on a stand. 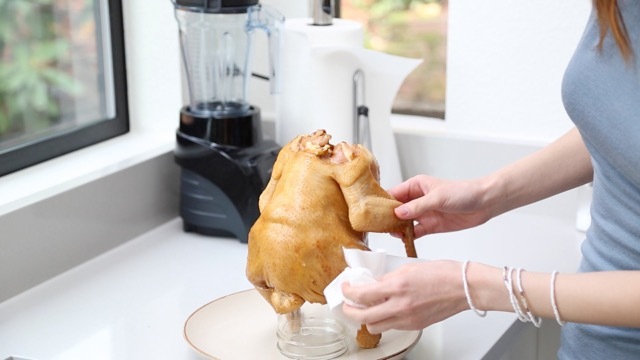 Optional step for extra crisp skin: Let the chicken air dry in your refrigerator overnight, or you can place in front of a fan for 30 mins. - 1 hour. If using the refrigerator method, remove the chicken an hour before baking so it cooks faster. Rub with cooking oil then the five spice rub. Cut up a small piece of ginger and place it in the chicken cavity. Pre-heat an oven to 425F degrees (use convection baking if you have this) and bake for 15 minutes. After 15 minutes, reduce the heat to 400F degrees and continue cooking for another 45 minutes. I recommend using a thermometer for your first time cooking this, as oven temperatures can vary. I usually aim for 160F degrees internal chicken temperature before removing and letting it rest. During resting time, it will continue to cook with residual heat up to 165F degrees. Make sure to let your chicken rest before cutting and serving. This will give the juices a chance to redistribute.